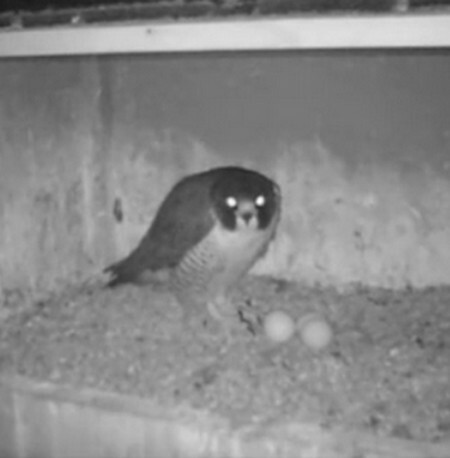 A little earlier this evening, Radisson laid her second egg! 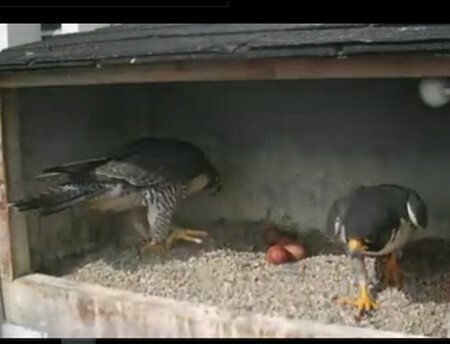 Just as she was literally in the process of laying the egg, Chase came in with food for her. His intentions were good, but his timing might have been a little awkward. Chase realized that this was not the moment to disturb Radisson, and left, taking the food with him. and when I gotup and went to archive, 3:24am she was standing over eggs. 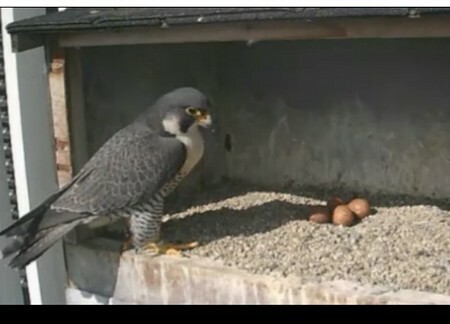 I'm happy to see that Chase and Radisson have their four eggs in the right place, and I hope all goes well for them. Lucky pigeon - at least for that moment! Check out Chase and Radisson if you want to see some babies! Now there are two! Thanks, burdi! Congratuiations to Radisson and Chase on their brand new chicks! thi sis why we love chase. He is a goof and he even gives Radisson a bite. A little while ago, I was able to access this cam while the live stream was actually functioning. The three chicks were not being brooded, and Radisson seemed much more interested in picking gravel. Chase similarly ignored the chicks, who had no food in their crops and seemed very hungry. 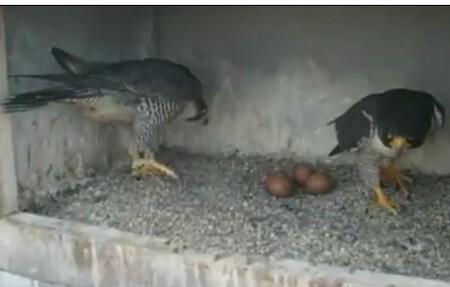 Meanwhile, the fourth chick was part way through hatching, and was totally ignored by both parents. The chick finally hatched, and Chase, who was in the nest, stepped on the chick on his way out, leaving the chicks alone. When Radisson returned, she had food and fed the three chicks, while ignoring the new hatchling. Chase came back and watched from outside the nest, and then went into the nest and deliberately stomped on the brand new chick, twice, before leaving again. 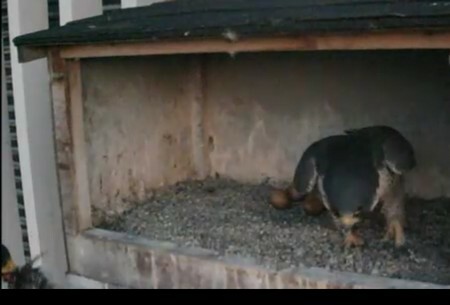 When Radisson returned after taking out the leftovers, she brooded the three chicks for a minute and left again. Chase came in once more and made a complete mess of attempting to brood the three older chicks. Radisson came back again, and eventually settled with the chicks under her. I thought these two were supposedly good parents. The way the tiny new chick has been treated, I think he has very little chance to survive. I looked at the recorded video and really don’t feel that Chase deliberately stomped on the chick, Alison. My take is that a few things were bothering him at that time. For instance, I think he was concerned about the other chicks who were hungry and very clearly begging him for food, and I strongly feel that he knew things were not going well for the little one. So when Radisson came in with food I think he simply wanted to make way for her as quickly as possible but accidentally made the wrong step. And I also believe that Radisson knew the little one was not strong, but no matter what the cause the parent usually gives priority to the strongest, sad as that may appear to some humans (myself included). 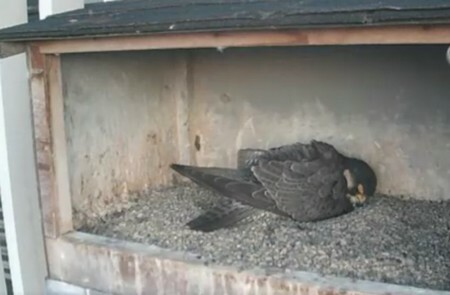 The video also showed that while Radisson was brooding the four chicks the tiny one was removed. I’m confident that Gordon Court will do what is best for this chick. Also, Bev keeps a very close watch on things and will likely report when she has a chance. I’m hoping for the best here but will have to wait to see what they say. 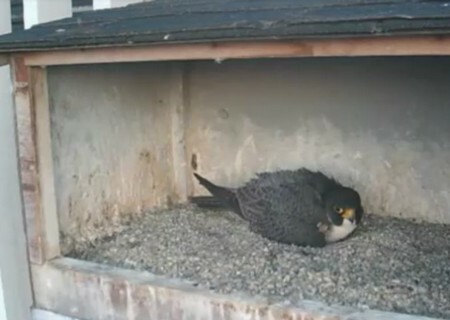 Chase makes me laugh at times, but I still feel both Chase and Radisson are very good peregrine parents. I haven’t seen the video but that i have seen very good parents ignore newly hatched chicks when the chick has a problem. Jules had a chick she never brooded just sat on her other chick and watched the weaker Chick die. The chick that died wouldn’t have survived - it had an external germination but more devastating was that his/her mandible was terribly malformed. Couldn’t see either on camera only when I had the chick in my hand. It is possible that the last of Chase’s and Radisson’s chicks was late hatching because it was already in distress in the shell and they knew it wasn’t going to survive. It maybe that Cahse and Radisson are “good” enough parents to recognize a chick that won’t survive. There was mention of Chase stepping on the chick - that most certain is a common occurrence - all of our females in particular have done it at one time or another. Some of the males too but often the females won’t let the males near their chicks until they are bigger - too big to step on. For that reason I wouldn’t automatically assume the second is related to the first. Just my two cents during a year that is all upside down. 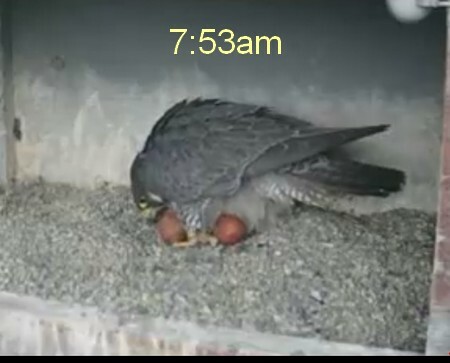 Here it is June 15th and we only have 1 chick . I should have banded a half dozen chicks by now with another half dozen to do in the next few days. Other sites report similar surprising or disappointing nest results. It is getting so wild this year nothing should surprise me. Gord has rescued the baby and it is being cared for as per Bev.